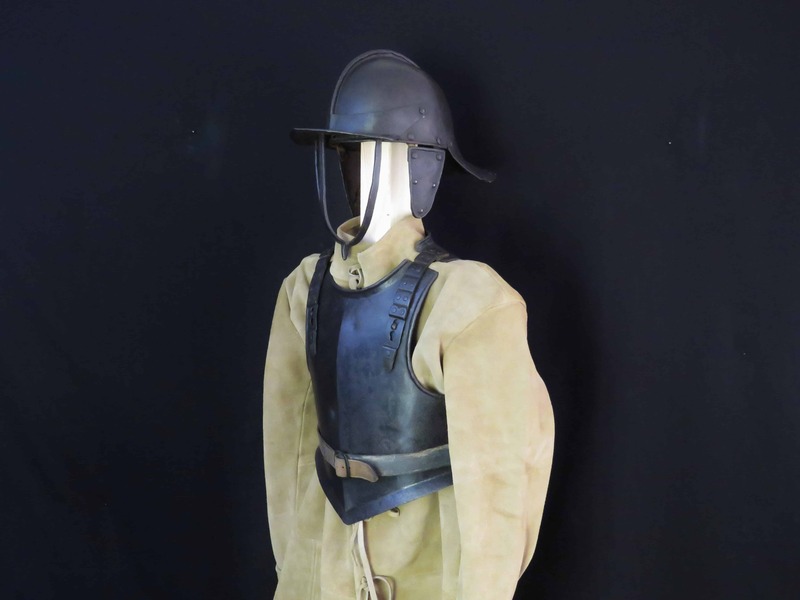 A composite English Harquebusier’s armour dating to the middle of the 17th century. 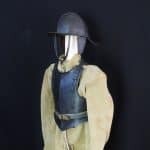 This purely functional English style of armour is synonymous with Oliver Cromwell’s victorious New Model Army of the English Civil War years. 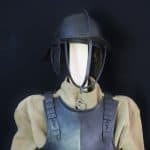 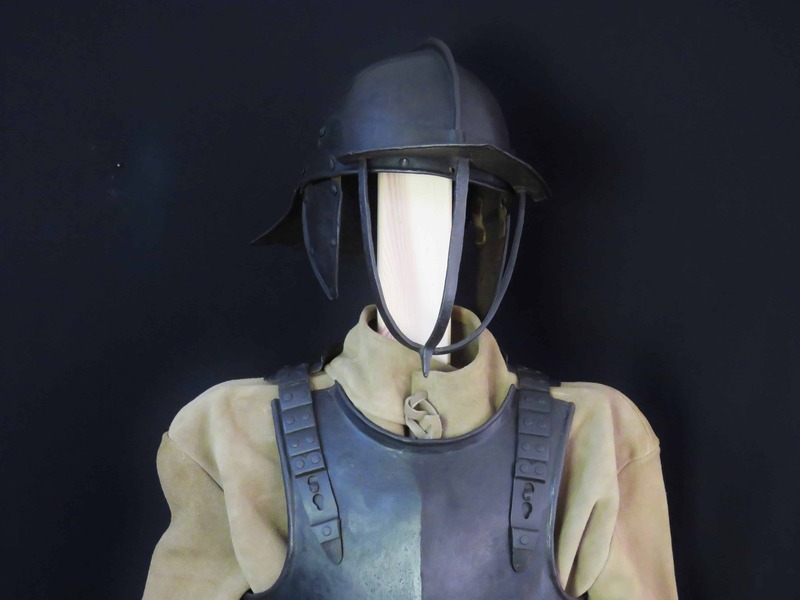 Typically, the armour consists of three component parts; a breast plate and a back plate plus a three bar lobster pot helmet. 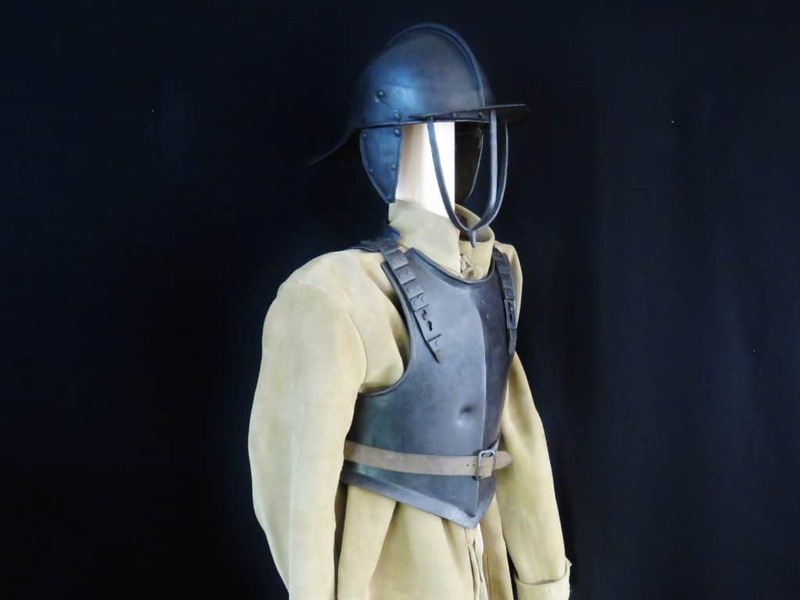 The plates are joined together by a belt and shoulder straps protected by rows of small studded panels. 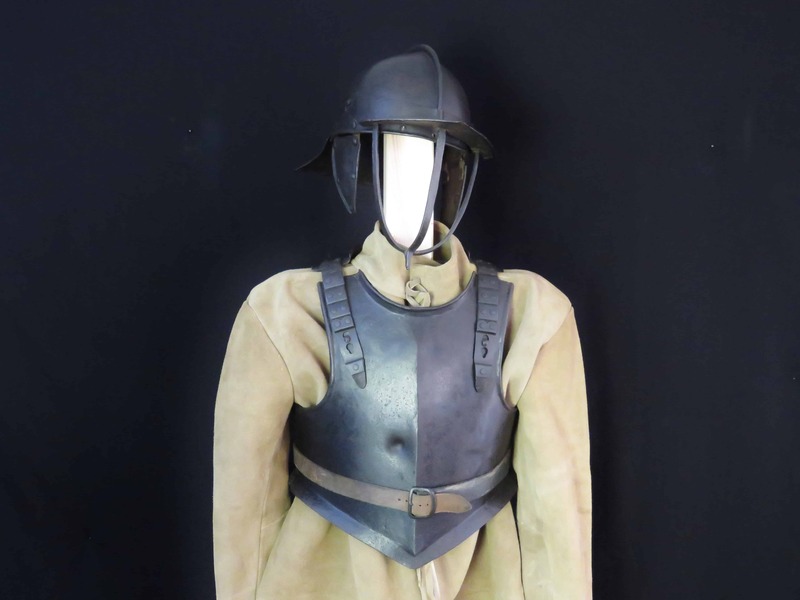 The armour is generally in good condition for its age and type and mounted with a modern buff coat on a wooden stand. 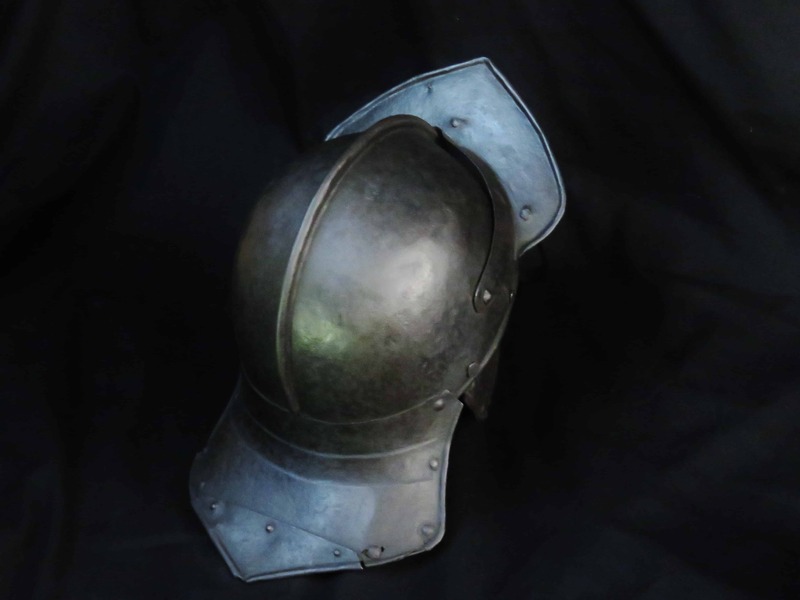 The iron surfaces exhibit a consistent blackened patination. 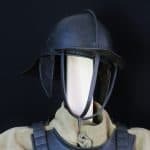 The helmet is formed from two beaten pieces of iron folded together in a low comb turned to the left above the skull. 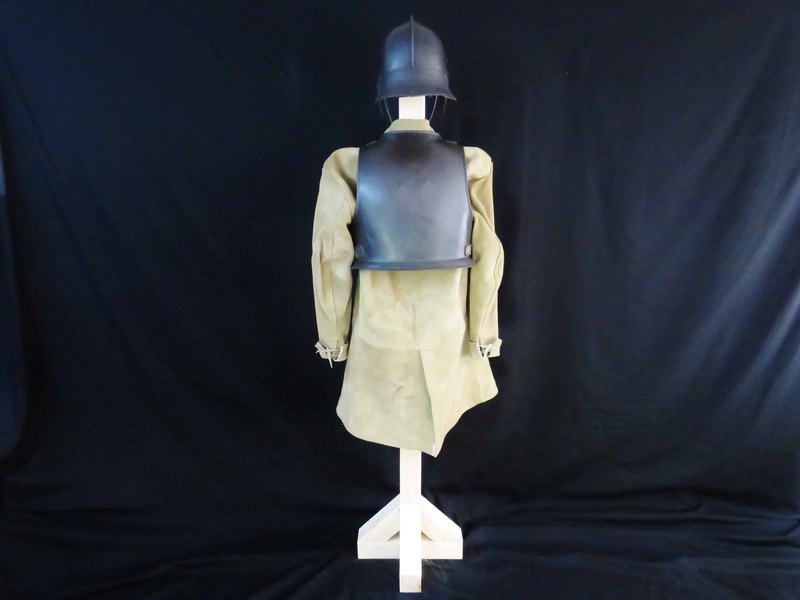 The neck guard at the back consists of three simulated lames flared towards the shallow medial point of the peak and folded at the edges. 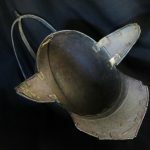 The cheek pieces are original, also with folded edges, and held in place with rivetted strips of leather on the inside. 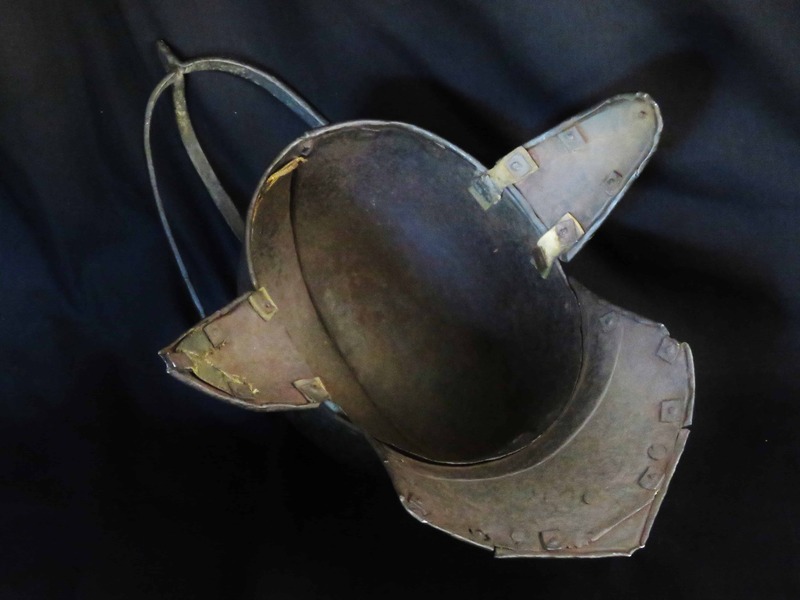 The articulated peak is attached with rivets either side of the skull and made with folded edges consistent with the rest. 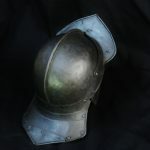 In the middle it is forged with a raised groove to allow it to be lifted from the face of the wearer along the comb over the front of the skull. 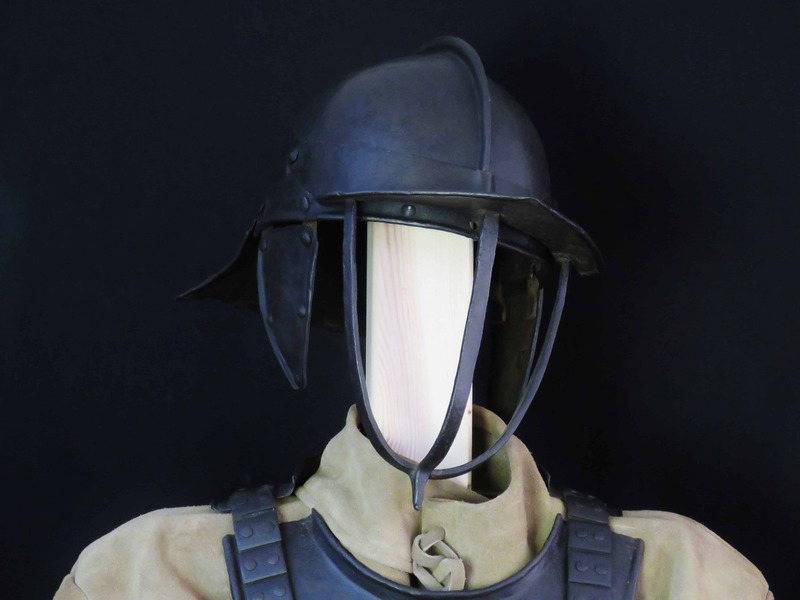 A face guard consisting of three tapering rectangular section bars converge into a finial at the base. 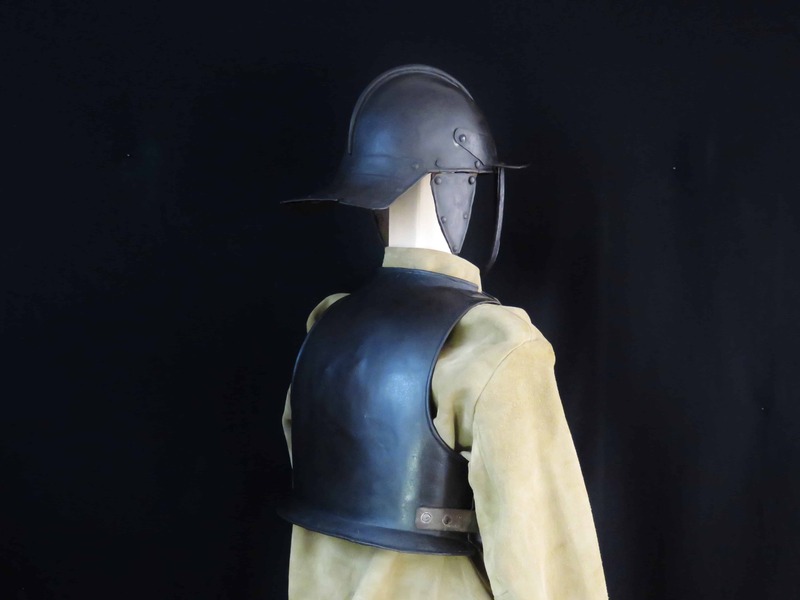 The peak is punched on the outside with an indistinct armourer’s mark. 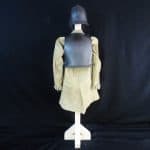 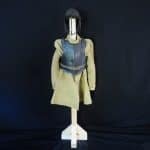 The breast plate is of typical form with a medial ridge, thickened rounded edges at the arms and neck and a shallow skirt with pointed base. 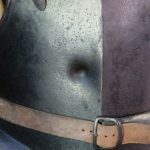 An indistinct armourer’s mark, resembling a deeply punched star, is present on the ridge near the neck with a further indistinct mark below this to the right. 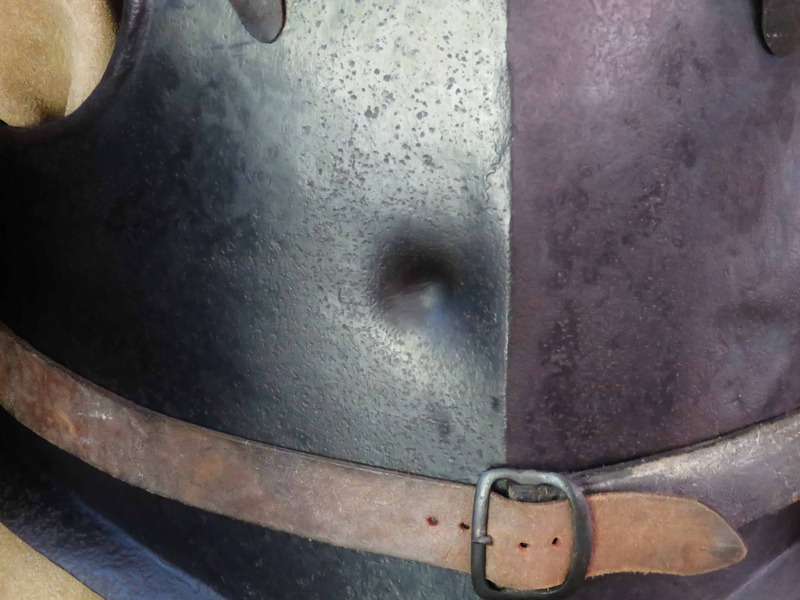 The back plate is finished in similar manner at the arms and neck and also has an indistinct armourer’s mark in the middle near the neck. 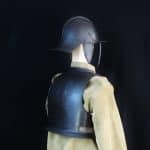 For references on armourer’s marks see: “The London Armourers of the 17th Century”, Thom Richardson, Royal Armouries 2004. 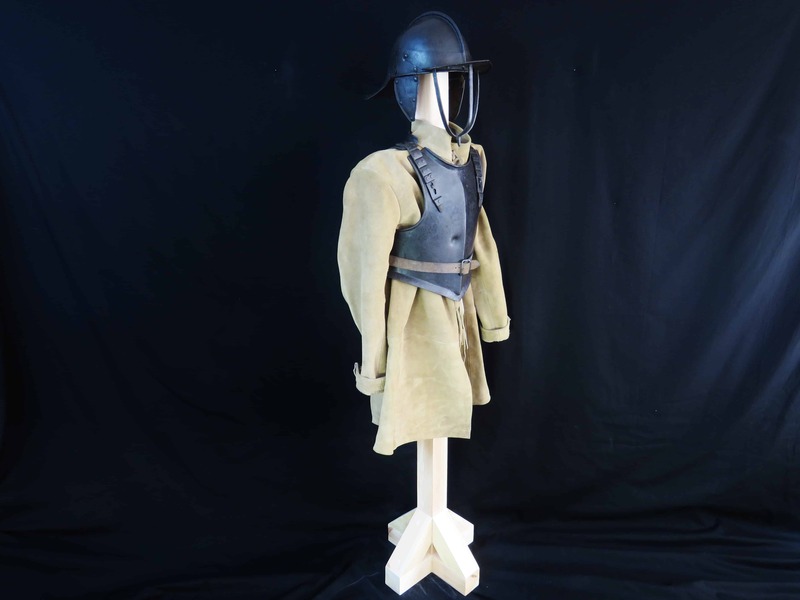 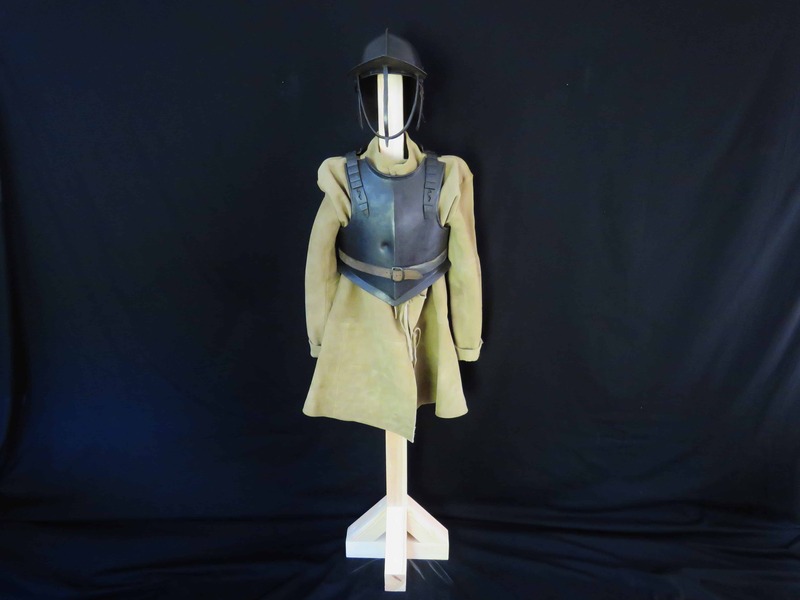 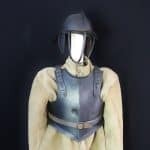 For further examples of Harquebusier and other 17th century English armours see “Littlecote – The English Civil War Armoury”, Thom Richardson and Graeme Rimer, Royal Armouries, 2012. 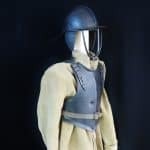 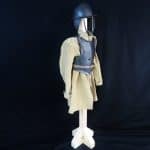 Note, it is generally accepted that almost all English Harquebusier armours from the Civil War years are comprised of parts by different makers.